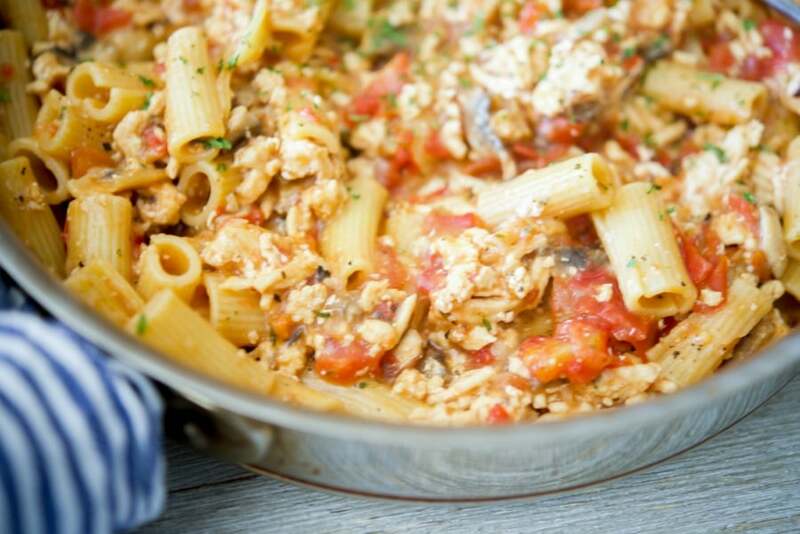 Italian Ground Chicken Pasta Skillet is a quick and easy, all-in-one meal that’s deliciously flavorful without the extra mess. I’ve seen so many people making recipes that can be made in one pan and let’s face it, who wouldn’t want less mess to clean up? I’ve already made a couple of sheet pan meals like this and this and I have to say it does make cleanup a breeze. 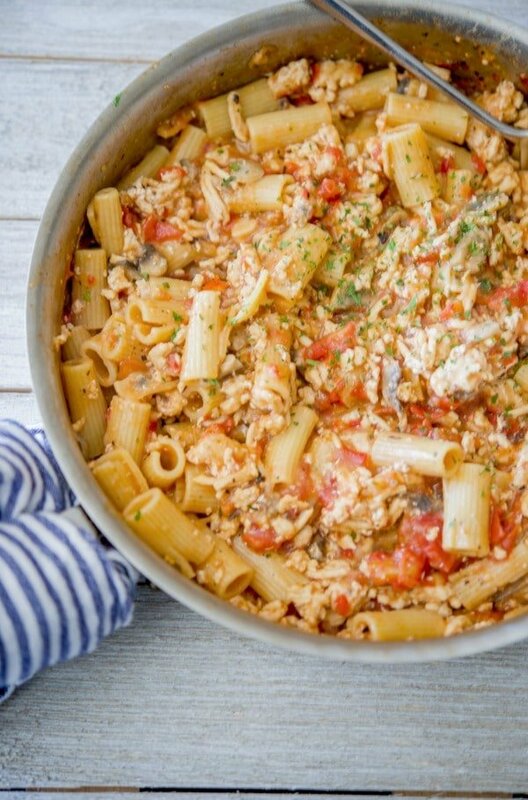 That’s why I decided to try making a pasta dish this way and used ingredients I had in the house to come up with this Italian Ground Chicken Pasta Skillet. I have to say that one of my new favorite staples to keep in the house is a can of fire roasted diced tomatoes. They’re so versatile can be used in so many different types of cuisines. They also give your recipes an amazing, smokey flavor and this recipe was no exception! 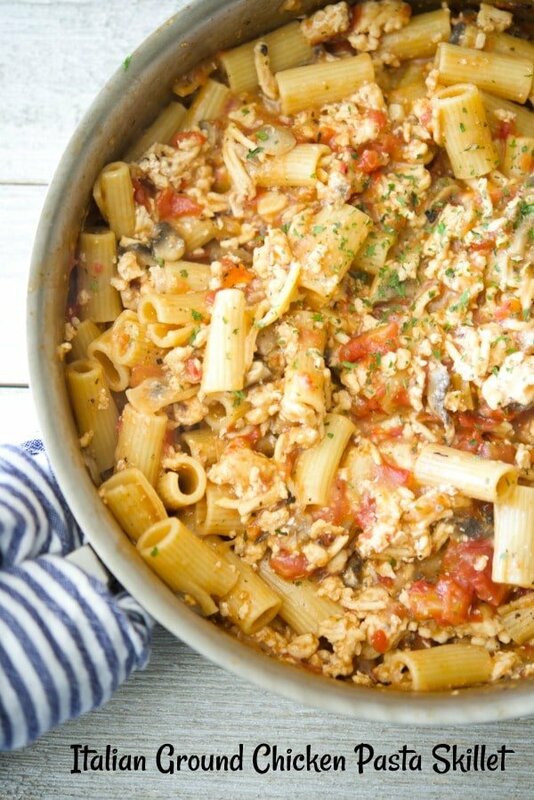 For this recipe you’ll need ground chicken (you can also substitute ground turkey, beef or pork), EVOO, garlic, mushrooms, onion, basil, fire roasted tomatoes, chicken broth, pasta (any type you prefer, I had Rigatoni in the house) and grated Pecorino Romano cheese. Start by browning your ground chicken by heating the oil in a large skillet and cook until the meat is no longer pink. Next, add your garlic, sliced mushrooms, diced onion and chopped fresh basil and sauté until the vegetables start to soften. Finally, add your can of fire roasted tomatoes (including the juice), chicken broth (I use a low sodium variety) and 8oz. of your favorite pasta (approximately half a box if you’re eyeballing it). Cover the skillet and reduce the heat to medium and cook 15-20 minutes until the pasta absorbs the liquid and is al dente. Cooking times may vary depending on the size pasta you use. 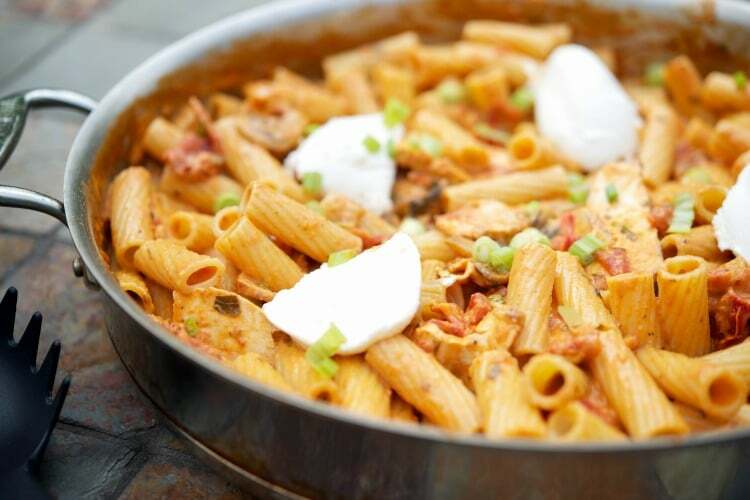 With Rigatoni, it took 20 minutes, whereas if you use macaroni, it may only take 10-12 minutes. Sprinkle some grated cheese on top and you’re ready to serve! 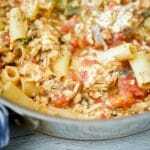 My family and I loved this Italian Ground Chicken Pasta Skillet and served it with a tossed salad. It was so easy, just throwing everything into one pan and the pasta was cooked perfectly. This recipe is enough to serve four people and takes about 30 minutes to cook from start to finish. ~Enjoy! 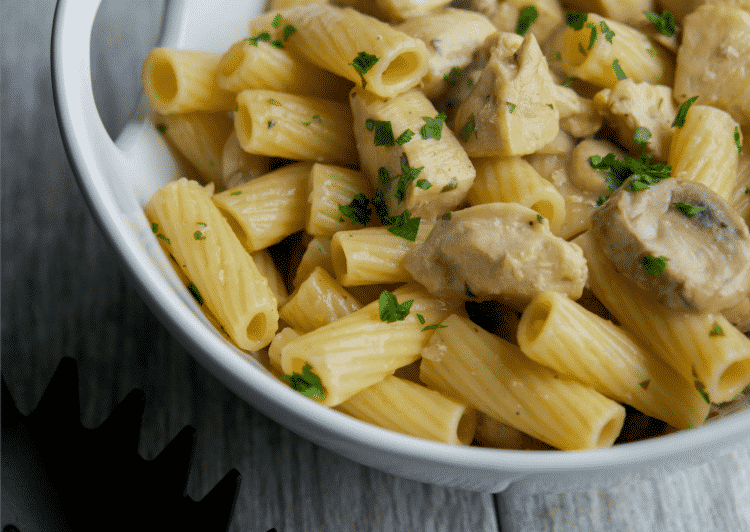 Italian Ground Chicken Pasta Skillet is a quick and easy, all-in-one meal that's deliciously flavorful without the extra mess. Brown your ground chicken by heating the oil in a large skillet and cook until the meat is no longer pink. Next, add your garlic, sliced mushrooms, diced onion and chopped fresh basil and sauté until the vegetables start to soften. Add the fire roasted tomatoes (including the juice), chicken broth and your favorite pasta (approximately half a box if you're eyeballing it). Finally, Cover the skillet with the lid and reduce the heat to medium. Cook 15-20 minutes until the pasta absorbs the liquid and is al dente. (Cooking times may vary depending on the size pasta you use. 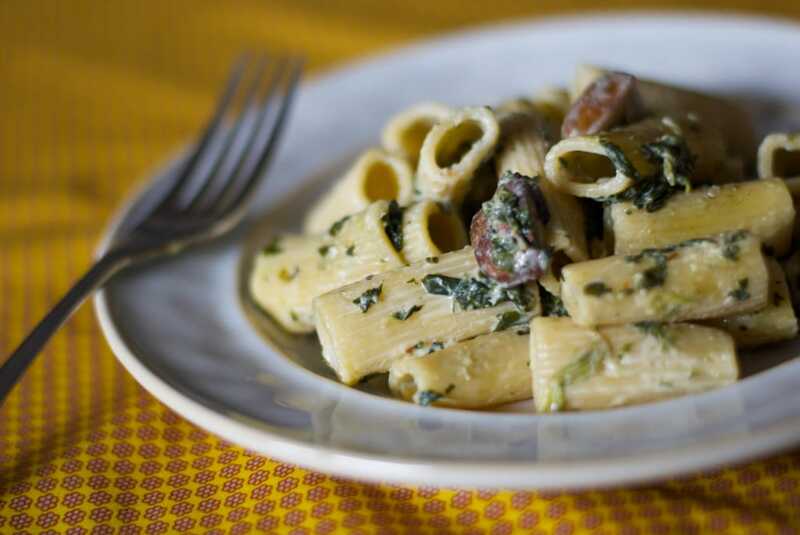 With Rigatoni, it took 20 minutes, whereas if you use macaroni, it may only take 10-12 minutes. )Sprinkle the grated cheese on top and serve. Oh dear !Agree to everything you say! Thank you and happy holidays !